Practical Small Animal MRI is the seminal reference for clinicians using Magnetic Resonance Imaging in the diagnosis and treatment of veterinary patients. Although MRI is used most frequently in the diagnosis of neurologic disorders, it also has significant application to other body systems. This book covers normal anatomy and specific clinical conditions of the nervous system, musculoskeletal system, abdomen, thorax, and head and neck. 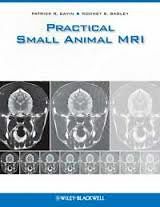 Practical Small Animal MRI provides extensive coverage of the nervous system, with several chapters on diseases of the brain and spine, including inflammatory, infectious, neoplastic, and vascular diseases, alongside congenital and degenerative disorders. Specific chapters also cover orthopedic conditions and other diseases of the head and neck, including nasal cavity and optic region, as well as abdominal and thoracic examinations. Introductory chapters provide basic information on the physics of magnetic resonance imaging and equipment selection. With more than 1,000 images, Practical Small Animal MRI is a must-have resource for veterinary radiologists, neurologists, surgeons, oncologists, internists, and all veterinarians using MR imaging in small animals.